After thinking that she would be ready to sit out the 2017 season to start a family, April Ross decided that she wasn’t ready to stop playing volleyball yet. “I thought I was going to be ready to stop and work on having a family, but when it came down to it, I wasn’t ready to stop,” said Ross. Having a family is still a high-priority for Ross; however, she is going to try again after the 2017 season, meaning she would sit out for the 2018 season. 2018 is the only year in the upcoming quadrennial without a major global championship. World Championships will take place in 2017 and 2019, followed by an Olympic year in 2020. This aligns perfectly for Ross. The short-term goal for the pair is to focus on the 2017 FIVB Beach Volleyball World Championships, which are set to begin on July 28 in Vienna, Austria. Previously, Ross won the world championship in 2009 with Jennifer Kessy while Kerri Walsh-Jennings won the previous three title with Misty May-Treanor. In the long-term, the team is looking to Tokyo 2020, both wanting to attempt to qualify for the Tokyo Games. Walsh-Jennings will be trying for her sixth Olympics at the age of 41, believing that 2020 will be her final season. 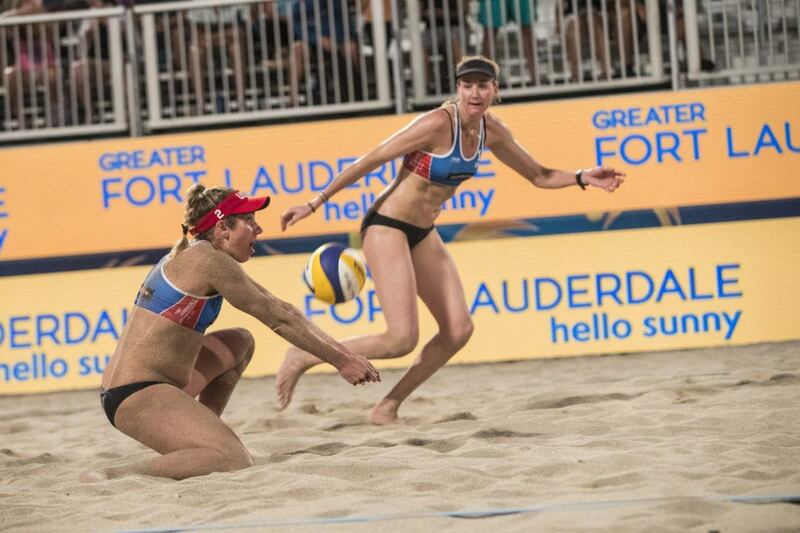 The pair opened up the 2017 season at the first scheduled FIVB event of the year, at the Fort Lauderdale Major. Ross/Walsh-Jennings began the season trying out something new, switching sides for the first time in their partnership. At the event, the duo ended with a fifth place finish, falling to eventual silver medal winners – Brazil’s Agatha/Duda. “It felt like we picked up right where we left off,” said Ross.